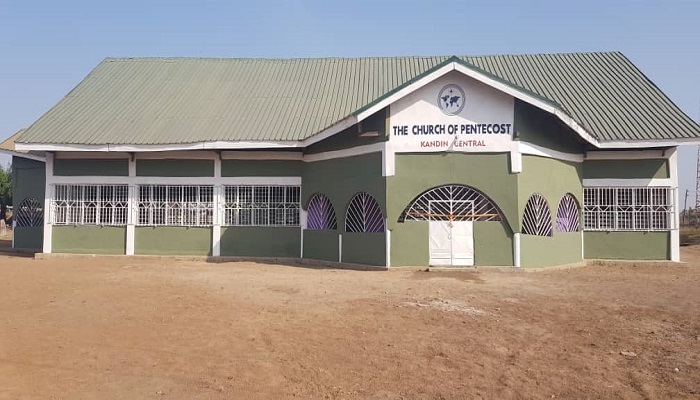 The Yendi Area Head of The Church of Pentecost, Apostle William Kojo Edzorhoho, on November 29, 2018, dedicated the Kandin Central Assembly church building. Present to assist the Area Head was the District Minister, Overseer Peter Abdulai Kwaku Darlinting and the Pastorate in the Area and their wives. The church in Kandin started in 1992 when Elders Phillip Osei and Daniel Niina organised a two-day rally which yielded 53 souls. This occurred when Pastor Isaac Essiamah was the Yendi District Minister. The new assembly fellowshipped in a classroom and later moved into a makeshift structure. They benefited from the Community Based Church Building (CBCB) fund in 2014 to begin the project at the time Apostle Dan Nii Teiko Tackie was the Yendi Area Head. The entire project cost GH¢74,287.00. Preaching the sermon at the service on the topic, “Rededicating Your Life To Christ” taken from Ezra 6:3-8 and 2 Chronicles 5:1-2, Pastor Peter Kwao of Yendi District, urged the members to rededicate their lives to Christ since He is the author and perfector of their faith. “In rededicating our lives to Christ, He comes to dwell in us for we are His temple. Our lives and attitudes must change because the Lord is in His temple,” he said. The Area Head, in his remarks, said that God does not dwell in temples built by men but rather in the hearts of men. He therefore called on believers to live a life worthy of emulation. Apostle Edzorhoho commended Overseer Peter Abdulai Kwaku Darlinting for beautifully furnishing the auditorium, making the Church very attractive to non-members. The event was attended by the acting Chief of Kandin, Obre Lalibe Bedumbe and his elders. Report by Yendi Media Team.